On February 6, 1997, Motorola unveiled the CPU code named "Arthur"and destined to be known as the G3 when Apple began using the CPU inNovember 1997. 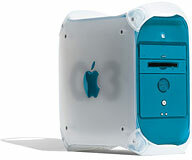 Unlike earlier PowerPC CPUs, the G3 was optimized forthe real world, especially the Mac OS and Mac software. Because ofthese efficiencies, the G3 provided almost twice as much processingpower as a PowerPC 604e - the chip used in top-end Power Macs - at thesame clock speed. The end results were killing off the market for most604e-based pro Macs and laying the foundation for the later G4 and G5CPUs. "Arthur represents the first time Somerset hasoptimized a new core based primarily on extensive execution of Mac OSapplications." The original G3 (a.k.a. PowerPC 750) had beendesigned to replace the 603e CPU used in consumer and notebook Macs.Compared with the 603e, it had a faster system bus, larger onboardcaches, added a second integer unit (which the 604e already had),improved floating point processing, and added branch prediction (alsoin the 604e). All of these contributed to its improved performance, anda side benefit was that the new CPU was also more powerful than thepro-oriented 604e. Much of this is detailed in "Arthur RevitalizesPowerPC Line" by Linley Gwennap (PDF), published Feb. 17, 1997. Dan Bashur (Apple, Tech, andGaming): The G3 era was when I really got into the vast majority ofMacs I have worked with/on and have used on my own. Dad got a Beige G3, and it was incrediblein comparison to anything else we had used before, but time and timeagain, I have recollected to my colleagues how much I was blown awaywhen my favorite computer lab at Ohio State transitioned from 80Power Mac 7100/80AV units to the same number of G3 Blue and White machines. The Blue and Whites looked modern, sleek, and almost beckoned out -Use me! With its unforgettablelarge G3 logo on the side of the tower and processing speed that waslight years ahead of the 7100, it was more than an upgrade. It feltlike a reinvention of the wheel. It also shipped with FireWire, andalthough it couldn't use Target Disk Mode, I can remember the lab guysthere being blow away by how fast the transfer rate was - and I can seewhy. Going from 11 Mbps USB 1.1 to 400 Mbps FireWire ushered in a wholenew era of high-speed peripherals, and when Target Disk mode wasenabled on newer models, it offered a new way to transfer data betweenMacs. 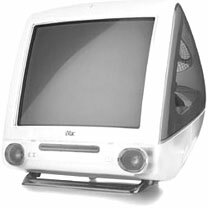 As much as I was blown away by the B&W G3 tower lab, theoriginal iMacs andiBooks were whatreally heated up the G3 era, and I had always wanted one or the other.I wound up settling on a 600 MHz Summer 2001 GraphiteiMac G3 due mainly for the desire of the included CD-RW drive(which at the time was a very expensive component itself). Too bad Ididn't see the writing on the wall with the forthcoming flat panel LuxoiMac G4 just fourmonths later, but my CRT iMac G3 stayed in service for seven years(until it was replaced by a 1.42 GHz eMac as my main Mac forthe next couple of years), and it still boots up just fine today - morethan a decade later - still problem free! It proved to be one of thevery last G3 Macs, but it was certainly one of the best with a muchimproved PPC 750cx compared to earlier G3 750 chips. 15 years have gone by since the advent of the G3, and it has beenmore than 14 years since the first Macs implemented the PPC 750, yet itcan be argued that they are still relevant today. 12-year-old Pismosare still in service running 400 and 500 MHz G3 processors. Just askCharles Moore, myself, Austin Leeds, or other LEM staffers and fans.The G3 was very stable and reliable, and in most cases was notsoldered, providing access to G4 upgrades (such as the 500 and 550 MHzG4s still offered for the Pismo), further extending the life of theproduct. Many consider the G3 and G4 era to be the "Golden Age" of Macs,where earth shattering changes in product design and technologyimplementation dominated (while providing maximum compatibility withbetter and better releases of Mac OS) versus incremental differences.Incredible quantities of these Macs are still in service today and canstill be quite useful running MacOS X 10.4 Tiger - even with modern Core "i" processors on thescene. 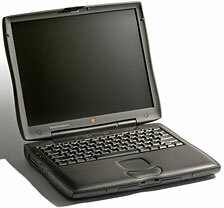 The 1998 WallStreet PowerBook G3. Charles Moore (several columns): Moving up from a 100 MHz603e to a 233 MHz G3 13 years ago was like crossing into anotherdimension. I actually cut my G3 teeth on one of the Level 2 cache-less"MainStreet" G3 Series PowerBooksin the fall of 1998. Even that much-maligned machine, which also wasApple's last laptop with a passive matrix LCD display, was so muchlivelier than my then 3-year-old PowerBook 5300. I was a local sales agent for a Mac reseller in another part of theprovince at the time, and the MainStreet 'Book was my demo. We soldmore of those PowerBooks than any other Mac models during that venture- except the ones people actually bought were all equipped with activematrix (TFT) displays and the full G3 with L2 cache, including the oneI bought myself in January, 1999. That 12" 800 x 600 resolution screen(essentially the same one used in the first generation ClamshelliBook) seems almost toyish now, but it was like the wide openspaces compared with the 9.5" 640 x 480 resolution passive matrixgrayscale display of the PowerBook 5300 I was migrating from. However, the G3's most impressive attribute was its speed, and that512 KB of L2 cache gave it plenty by the standard of the day. You couldactually multitask with it at reasonable levels of efficiency, andremember this was in the days before Mac OS X brought real preemptivemultitasking to the Mac. My next G3 machine was a used Pismo PowerBook that I boughtin 2001 and still have in active service, although it's long-since beenupgraded to 550 MHz G4 power. Its original 500 MHz G3 CPU offered anice performance boost over the 233 MHz WallStreet, but nothing nearlyas dramatic as the first G3s were compared with the 603 and 604machines. My last G3 was a 700 MHz iBook I bought newin 2002, but it never seemed much, if any, quicker than the 500 MHzPismo, which had a larger L2 cache. I no longer have a working G3 Mac, as both of my current Pismos haveG4 upgrades, but I found the 500 MHz 750 chip a surprisingly goodperformer running OS X 10.4 Tiger before I upgraded the most recentunit, and I remember the G3 processor with great affection andnostalgia. It was truly a watershed in the Mac's evolution. Simon Royal (TechSpectrum): My first experience of the Mac was on an old Quadra at apublishing house. The whole department was upgraded to G4s, and as thenew comer to the department I was given a 600 MHz Graphite iMac - to meit was amazing. It's speed was phenomenal even in the dawn of the G4range. I took home a Beige G3 tower that had been replaced by a G4, andthis gave me a huge opportunity to get my teeth into the whole Macexperience. Using an iMac G3 running OS X 10.2 Jaguar at work was amazing,but coming home to a Beige G3 running OS 9 started to frustrate me, soI bought an 400 MHzIndigo iMac G3, and the rest is history. Having owned over 30 Macs and being a big low-end Mac user, the G3range has given me some of my most beloved and reliable Macs. Whileoutdated, the ultra reliable PowerBook G3 range make awesomesuperstrong portable writing machines, and an iMac G3 still looksawesome in any house. The G3 with it's awesome power, coupled with the gorgeous looks ofthe iMac G3, made it iconic and pulled Apple from the brink. Dan Knight (Mac Musings): Ifirst used a Mac in late 1986, and I remember how exciting the Mac II was with its 16 MHz 68020 CPU andcolor support. It more than doubled processing power, and we reallyhaven't seen that big a jump in performance since then. The68040-powered Quadras were a big step forward in efficiency, but thefirst Quadras also ran at lower clock speeds than the top-end 68030Macs, so while we saw an improvement, it wasn't stellar. The same goesfor Apple transitioning to PowerPC as well as moving from thefirst-generation PPC 601 to the 603 and 604. The G3 was probably the biggest improvement in Mac CPU technologysince the Quadra. The 266 MHz Beige Power Mac G3 outperformed the 350MHz 604e in the top-end PowerMac 9600, quite a breakthrough - and the kind of thing we wouldn'tsee again until the Mac went from Core 2 Duo Intel CPUs to its moreefficient Core i family. I worked in publishing at the time, and our production machines weremostly Power Mac 7500s and8500s. The first Beige G3swere a revelation, especially for things like Quark XPress, FrameMaker,and Photoshop. Apple was able to ride the G3 from late 1997 throughlate 2003, when the last G3 iBook was replaced by a G4 version. And quite frankly, the G4 was just a G3 with the Altivec velocityengine added and better support for multiple processors. Likewise, theG5 made some improvement to system bus speed and clock speed, but theunderlying architecture was just an evolutionary improvement to the G3that Motorola had unveiled in February 1997, an architecture thatcarried the Macintosh through the end of the PowerPC era. Best of all, a lot of those old G3s can still be useful with enoughmemory and OS X 10.4 Tiger installed. I don't think I'd want to runanything below 400 MHz, but get into the 500-700 MHz range, and you'vegot some nice iMacs and iBooks to pick from, not to mention the belovedPismo.